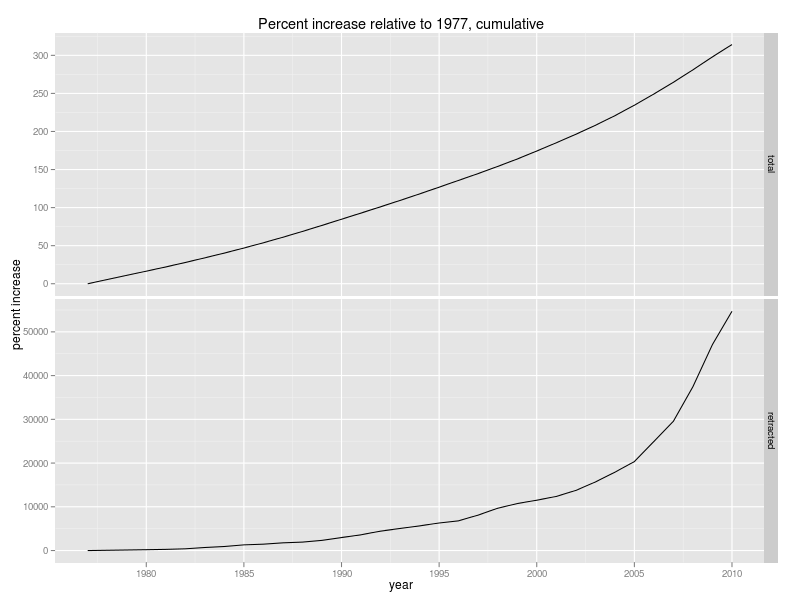 The decline of tenure and the rise of retractions: causation or correlation? Amidst the recent flurry of discussions about research assessment strategies came Neil Saunders and posted his analysis of the number of retractions indexed in PubMed. At the same time, Giorgio Gilestro weighed in with his opinion on what needed to change about the way we do science. One of his arguments was that tenure had served its purpose and needed to go. The discussion about tenure is an old one and comes back every 20 or so years. And yet, tenure is still around. Or is it? Now clearly, this isn't a one-to-one correlation. there is obviously a nonlinear relationship between the development of the retractions compared to the decline in tenure. It's a linear decline in tenure, whereas the increase in retractions clearly isn't. But then again, perception probably isn't a linear process anyway, so if the perceived pressure on scientists is driving misconduct, once the tenured psoition drops below a certain threshold, the number of retractions will necessarily go up. If this interpreation holds, we passed this threshold around 1990, or at a percentage of tenure-track positions of about 40%. Intriguing correlation, but is there causation?